It was by pure chance that I ended up with not one but TWO huge LOMO zooms a couple of years ago. One of them was the LOMO 35OPF18-1 20-120mm T/3.3 which is an absolute monster as you can see side by side with Canon’s EF 70-200mm f/2.8L, but the subject of today’s post is the much smaller 35OPF1-1. 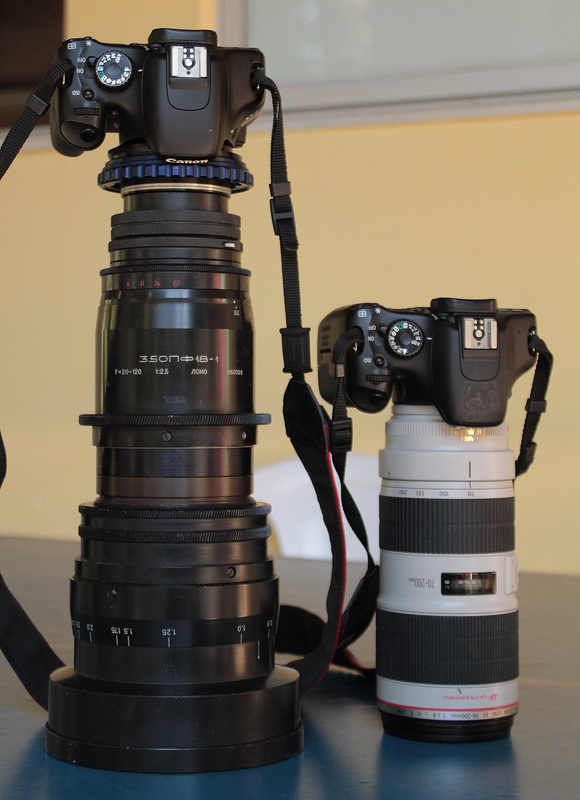 LOMO’s 20-120mm vs Canon’s 70-200mm. This is NOT the lens I’m reviewing here! This is a big one, coming in a big metal case full of Cyrillic writing. The 35OPF1-1 is a 50-150mm designed and made in the experimental optics factory CKBK (same plant responsible for the superspeed LOMOs and some of rares anamorphics ever). This 1984 model comes in OCT-19 mount – which is the Russian version of the PL mount, sturdier, of course – and I’m using an OCT-19 to EF adapter. As a film lens, it was designed to cover a film frame, meaning S35 coverage. On full frame you get lots of subtle vignetting and some not so subtle vignetting at the wider focal lengths. On S35 it delivers optimal performance. Getting the objective stuff out of the way: minimum focus is at 1.2m (4ft) and aperture ranges from f/2.2 to f/4 (T/3.3 to T/5.6 according to markings on the lens). Yep, it’s a pretty limited aperture and I don’t fully understand their reasons for it… Such narrow range ensures that the eight blades keep bokeh perfectly round through all values. All rings are butter smooth in this copy and the aperture ring is maybe even a bit too smooth, offering no resistance to turning. This beast weighs 3.5kg (7.7 pounds) and measures 25cm (10 inches) from top to bottom. The filter thread is 105mm and the full focus throw to infinity is 300 degrees. My copy is plagued with fungus, though. It came like that from the previous owner but, fortunately, the parasites are already dead, as they haven’t grown in the years I’ve had it. You can take a better look at the lens and the fungus in this album. Now let’s move to the interesting stuff. Every time I put this lens on the camera I think I should, instead of get rid of it, come up with ways of making it work with my style. This lens delivers all the artifacts I work hours to achieve in post. But here they’re at the perfect amount and much more organic than what I achieve in post. Chromatic aberration is strong around the corners and pretty much on all high contrast edges at the longer end, the blue channel splits from the others. You can spot that around Ariana’s face in some of the close ups. It doesn’t bother me so much, as it seems subtler on the focused areas. Speaking of focused areas, you can definitely tell when something is in focus, even at f/2.2 and the roll off to the out-of-focus areas is milky and pleasant, giving the image a dreamy quality that I seek. Bokeh looks like soap bubbles – the famous and expensive trioplan look -, with sharper edges around the circles. In some shots you can notice a dark shape in the center of bokeh and that is being caused by the biggest fungus spot. My favorite part about this lens is the blooming and flaring, definitely. You can spot it right away in all of the sunset shots and when strong light hits the glass. The warm tones and highlights bleed onto the darker foreground (mostly Ariana’s face or jacket) in a way that I am yet to learn how to fake in post. All of these artifacts combined give the lens a look that is the complete opposite of modern glass, sharp, contrasty and clean. From now on I’m using this video as the supreme example of why I choose to shoot using vintage glass and pursue this road of exotic and unusual optics. In terms of usability, this lens requires some sort of support system. From what I’ve seen in Olex’s video of its turnaround, there is a Russian support, but mine came without it. So far, I’ve been working out my arms, but if you want to use this in real life, you should really come up with a solution. A good thing in terms of adapting this to modern cine cameras is that the original OCT-19 mount can be easily replaced with a PL mount. Overall, this is powerful long zoom, going from a normal length (50mm) to super tele (150mm) able to keep a fast and constant aperture through its entire range. Size and weight are definitely a challenge if you’re shooting run and gun, but not so much if you’re used to cinema super zooms. All the optical craziness can be seen as a positive or negative factor, depending on how you like the look of your footage straight from camera. If you like this lens and like what you read here, I’m letting go of it. Here’s the link to the listing! Following right behind the Kowas (B&H, 16-H and 8-Z) comes the Sankor 16-D, a little clumsier than its competitors, but with glass big enough to deliver good results and small enough to not encumber. I’m Tito Ferradans and today we’re gonna talk about the Sankor 16-D. While not as great as other projection lenses I’ve reviewed before, this Sankor is still a good performer. It has flares similar to the Kowa 8-Z and 16-H and can deliver beautiful cinematic imagery. As any projection lens, it’s double focus, and I’m using a single focus solution to make it friendly. Another thing about projection lenses, if you’re close focusing WITHOUT diopters, you’re also changing the stretch factor – as explained in this episode – so keep that in mind. Bokeh is nice and long and the edge aberration can be beneficial to some projects. When I started out in anamorphics, there was an obvious rank of best projection lenses. Aim for a Kowa B&H. If you can’t get one, go for the Kowa 8-Z. If that’s still not achievable, get yourself a Sankor 16-D. Being third place, among all projection lenses is no easy feat. It also helps that these three are more commonly found than some more obscure – yet amazing scopes. This is a 2x stretch adapter, double focus, and focuses down to 5ft, or 1.5m. It has sizeable glass, so it won’t eat away much light from your taking lens, but it’s considerably longer than the Kowas. As for attaching it to a taking lens, the Sankor doesn’t have standard threads. You can get front and rear clamps. As usual, I have my custom support clamp that you can download and 3d-print. This adapter weights 545g, I’d recommend using rails. For attaching diopters and filters to the front, I will strongly recommend Vid-Atlantic’s replacement ring. It’s much more elegant than a clamp, as you screw out a piece of the Sankor and replace it with the custom-made ring, which has 72mm filter threads. We are moving down the line regarding prices and the Sankor 16-D, even though not super common on eBay, goes for a more manageable price, between $250-450. Make sure you’re getting a clean one, as many of these have hints of fungus or scratches. You get excellent results at the center at any aperture, but the edges become less reliable and introduce chromatic aberration as you open up the taking lens. One thing that was very noticeable with this adapter is how the size of the front element in the taking lens affects the result. Just compare the Contax Zeiss 85mm results with the Jupiter 9’s and you’ll see what I mean. The huge Contax has way more vignetting and lower image quality, while the Jupiter delivers much better results because of its smaller size. The Sankor 16-D has similar coatings to the earliest Kowas, delivering cool, purple-ish flares that resemble the flares from REAL anamorphic lenses with a much higher price tag – I mean Panavision. The length of the Sankor affects its vignetting negatively. Anything upwards from 100mm is your safe range for full frame 3.56:1 aspect ratio. You can get a barely clear 3.56:1 aspect ratio on full frame with a compact 85mm – but not with all 85mm’s -, and 2.4:1 at 58mm. 50mm is way too wide and will give you black edges no matter what. Keep in mind that if you’re adding a single focus solution, that will build into vignetting. If you want help with this math, or convert it all to a different sensor size, use my calculator! The Sankor 16-D squeezes in the first tier of projection lenses, thanks to its big glass and good results. Flares are also desirable, but for me it requires too long taking lenses and it’s shape makes the whole setup a long train of lenses and very front heavy. One of its strong aspects is that it can be had for cheaper than the Kowas. That concludes this week’s review. If this video was useful to you, share it with your friends! Let’s make anamorphic a mainstream thing! Feel free to ask questions in the comments and be sure to subscribe. If you REALLY like this channel, you should consider joining our crew at Patreon, where you can get rewards like aperture discs, t-shirts and others, but more importantly, discuss upcoming episodes! Join us! I’m Tito Ferradans and I’ll see you next week. Time to review another member of the Kowa family. The 8-Z is side-by-side with the Kowa B&H in terms of performance, but are there any actual differences? Tito Ferradans here for a review of the Kowa 8-Z. This adapter is a solid performer, delivering excellent results regardless of aperture setting. It has lovely vintage character and organic cool flares. Being a projection lens, it is a double focus setup, so you’ll face challenges when shooting or you’ll need a single focus solution. Definitely a top drawer lens, with artifacts just enough to give the footage some mojo. The Kowa 8-Z is one of those lenses everybody wants. When someone asks “what is a good projection lens?” it usually comes up right after the Kowa B&H. The 8-Z has a twin sister, the Kowa 16-H, they’re considered the same – but that is subject for another episode. It is a “true anamorphic” adapter with 2x stretch. Focus comes from infinity down to 1.5m or 5ft. Japanese design, with big front and rear glass ensure you won’t be losing much light. You’ll need a rear clamp to mount it to your taking lens as well as a front clamp to attach diopters and filters. I’m using a Rapido clamp for the front, and you can find the link for it in the description. For the back, I have a custom 3d-printed one that you can download at the blog. I like having this one on rails because of its weight of 510g. Even though it doesn’t reach the high prices of the B&H, the 8-Z is still uncommon. It usually goes between $500-650 and many of them are shipped out from Japan. Shaaaaaarp! The Kowa 8-Z starts to suffer only at close range, if you don’t use diopters. I would say to avoid the hassles of double focus, but this is a personal call. Aaand I was caught off-guard by these flares, as I expected them to be blue! According to feedback from several other users, both versions exist, but the blue ones are much harder to come by. The earliest versions are the ones with cool flares while the modern ones are all golden. This one is still in line with what we saw on the Kowa B&H. By itself, the 8-Z can go as wide as 58mm on full frame for 3.56:1 aspect ratio. Coming down to 2.4:1, you can use a 50mm lens. Like the B&H, the 8-Z has strong veiling glare when a light source hits the edge of the lens. You can fix that by following the steps detailed in this other video. This will mute the glare and give you better screen real estate. My friend Matt Leaf argues that the veiling glare is a key part of anamorphic, so, make up your mind before you decide between doing the mod or not! Speaking of mods, anything I said about modding the Kowa B&H can also be done to the 8-Z, so check those out if you wanna improve your lens! If you liked this review, make sure you hit the like button and help me out by sharing the video with your friends. If you have any questions or suggestions, leave them in the comments and I’ll get back to you. Before you go, don’t forget to subscribe and if you really like this channel, you can support me on Patreon and get awesome rewards, becoming a part of the team and deciding which episodes come next. I’m Tito Ferradans and I’ll see you next week.